Home / See & do / Top Sights / Top 10 / Mons with the family / Where’s the fun at? / Adventure time / Goolfy and Lasergame make a pair! Come and visit “Goolfy et Lasergame Mons” and have some chill-out time with your family. A unique golf course, a Star Wars-themed laser tag centre unlike any other in Europe, a children’s play area and numerous arcades await you! No particular level of physical fitness is required, but you have to be up for fun! A mini golf course and a laser tag centre with fluorescent colours! 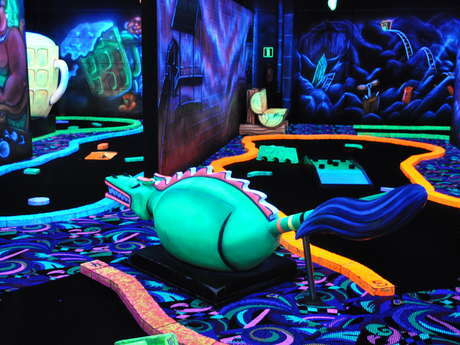 “Goolfy” showcases famous Belgian monuments and inventions in a mini-golf course with fluorescent colours to impress you. Each section contains little historical monuments so the whole family can learn while having fun. All the family (children aged three and over) can come and test their skills! The Lasergame bears the colours of the famous Star Wars saga and is one of a kind in Europe! Over two floors of fluorescent settings, come and have a family showdown! Children aged eight must be accompanied by an adult. The Lasergame is available by reservation only for a minimum of five people. Little ones aged four and over can have fun in the “Doudou Zone” play area bearing the colours of the famous Ducasse of Mons. Children aged three and over can use the self-service arcade area with games that will appeal to all the family: games for toddlers, a photo studio, Mario Kart, a kicking machine, basketball, dance, air hockey areas and more – enough to keep you occupied all day! You can combine a round of Goolfy and Lasergame to make the fun last longer! After a game of Goolfy, for instance, you can book a game of Lasergame for 15 minutes. Various options including a meal are also available! Would your child like an amazing birthday? Well, here’s their chance! For children aged four and over, you can choose various options including rounds of Goolfy and/or Lasergame. Whether you opt for the “Doudou Zone”, “Anything’s allowed on Wednesdays” or our “cocktail workshops” (no alcohol, of course! ), this special day will be a memorable one! After using up all your energy running around and fighting, you can cool off and relax at the lounge which you can access from the play areas. Get out your lightsaber and play a few rounds! It’s all happening at PASS’!